Premier Christy Clark says the new centre will help create good paying jobs and grow the economy. B.C. Premier Christy Clark gets a hands-on demonstration in the sheet metal workshop at Okanagan College's new trades training complex during her visit Thursday to open the complex. 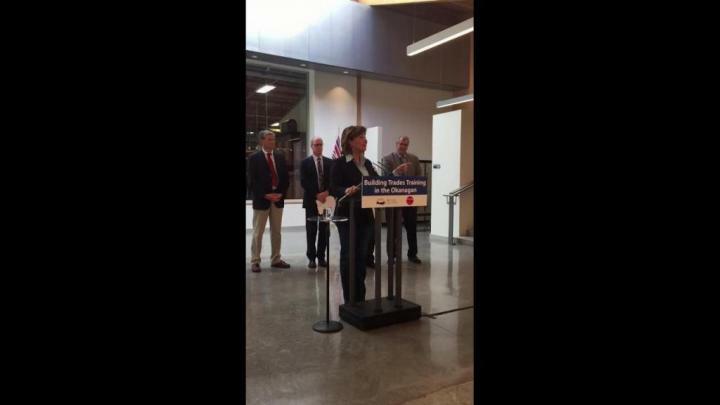 Premier Christy Clark has opened the new trades training centre on the Kelowna campus of Okanagan College. The $35 million complex, which includes a total of 10,000-square-metres of new and renovated space, provides shops for several trades including welding, plumbing, sheet metal, automotive, carpentry and joinery, electrical, gas fitting and heavy duty mechanical. Clark, who was given a tour of the complex and talked with students before addressing an audience in the building’s foyer, said by investing in the trades training centre, the government was helping to create new jobs in the province. The province provided $28 million of the $35 million cost of the new building, said OC president Jim Hamilton, who lauded it as an example of how seriously the college takes its role as a trades trainer. The other $7 million was raised by the college through its Bold Horizons campaign, which many local business contributed to. Currently, Okanagan College is the second largest trainer of trades in B.C., after BCIT in the Lower Mainland. Hamilton said the new building is one of the most sustainable of its type in the country and was been built to LEED platinum standards. It includes many energy saving features including an enhanced on-demand air filtration system, radiant heating and cooling, geothermal ground source heating and cooling, an extensive use of wood, natural vegetation and xeriscaping in the its landscaping and double bands of windows in each floor to balance solar heat and light impact. The building is also outfitted with the latest equipment for students to learn on and has enabled the college to bring all its trades training programs into one building for the first time in many years. In the past, OC has had to use rented space throughout the city for some of its programs because there was not enough space in the former workshops and trades-area classrooms at the KLO Road campus. Some of the buildings that the new complex replaced dated back to the early 1960s, when the campus was first built. Clark said she hopes the new training facilities at Okanagan College will encourage many students who come here to learn a trade to stay in the area after they graduate. “After you come to this community, even once, you should never want to leave,” said Clark, who is also the MLA for Westside-Kelowna, a riding that includes West Kelowna and part of downtown Kelowna.